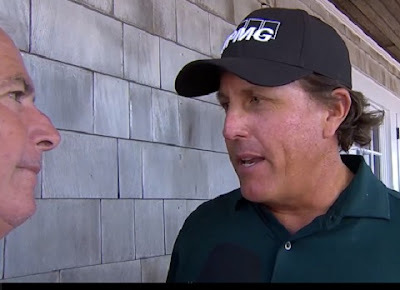 There appears to be some continued uncertainty about the basis of the ruling with Phil Mickelson during the third round of the 118th U.S. Open, and we would like to further clarify previous statements. During play of the 13th hole Mickelson made a stroke on the putting green at his ball, which was moving. 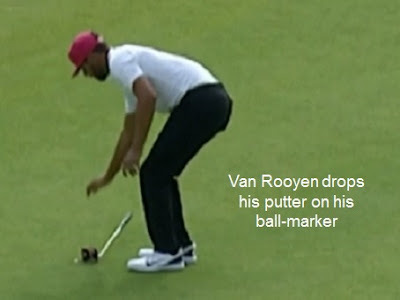 As a result, he incurred a two-stroke penalty for a breach of Rule 14-5; the stroke made at the moving ball also counted. His score for the hole was 10. Rule 14-5 does not include a serious breach clause or disqualification as part of the penalty statement. 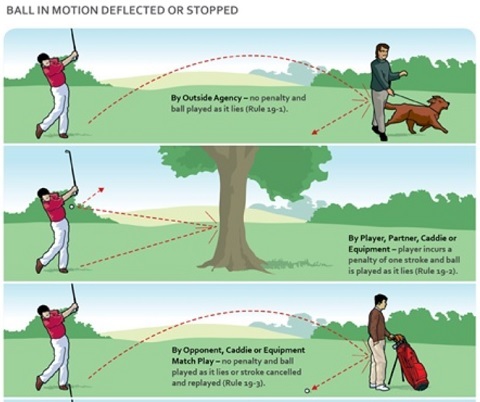 Rule 1-2 did not apply in this situation because Mickelson made a stroke at the ball (defined as the forward movement of the club with the intention of striking at and moving the ball) as opposed to another act to deflect or stop the ball in motion, which are two acts covered by Rule 1-2. Additionally, Exception 1 under Rule 1-2 states that “an action expressly permitted or expressly prohibited by another Rule is subject to that other Rule and not Rule 1-2.” As the act of making a stroke at a moving ball is expressly covered by Rule 14-5, that Rule and the penalty associated with that Rule were applied. The Committee looked at the facts of the situation and determined that there were no grounds under the Rules of Golf for any further penalty, including disqualification. The key point is that Mickelson made a stroke at his ball in motion, the forward movement of his club made with the intent of striking it to the hole. Rule 1-2, which many have been confused by, relates to a player deflecting or stopping a ball. An example of this would be when a player, after chipping their ball up a steep slope, sees it roll back down the slope and to avoid it ending up in the water of a water hazard, they either stop it or deflect it sideways. Interestingly, the ruling on this incident would be the same under the new Rules of Golf - 2019, as they are currently drafted. “I know this should've come sooner, but it's taken me a few days to calm down. My anger and frustration got the best of me last weekend. I'm embarrassed and disappointed by my actions. It was clearly not my finest moment and I'm sorry“. 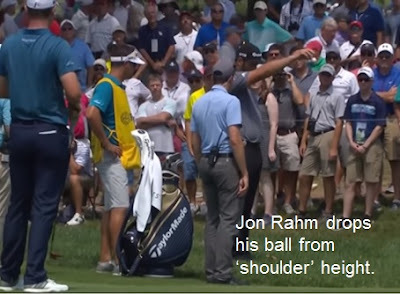 Presumably, Johnson was aware of this Rule, because he waited to see if the ball was going to drop before slowly walking to the far side of the hole, apparently counting off the 10 seconds on his fingers, and then taking a stance and placing his club behind the ball to tap it in. This is when the ball dropped into the hole and he immediately stepped back. He knew that the 10 seconds time limit had passed before the ball hit the hole, so there was no question of the ball being holed with his previous stroke. However, this did not stop him from calling an official. Well, let me tell you why! The bolded part of Rule 16-2 above, says that after the 10 seconds limit the ball is deemed to be at rest. Not at all vague. After this time expires the player may make a stroke at it or mark and lift it. They do not have to be concerned about making a stroke at a moving ball, because it is deemed to be at rest. Even if they replace the ball on the lip and it subsequently falls into the hole the player is deemed to have holed out with their last stroke and has to add a penalty stroke to their score for the hole; so the score will be the same as if they had hit it in the hole (Decision 16-2/0.5). The incident can be viewed at this YouTube link. A reminder that you can ensure that you continue to receiving my fortnightly blogs on the Rules of Golf by subscribing to The Oswald Academy newsletter, which will replace mine over the next few months. Between us, Brian Oswald and I will be endeavouring to keep you updated on all things related to the Rules of Golf, including explanatory articles, incidents and rulings on the Pro Tours, quizzes, book recommendations, teaching materials and tips, seminar information and much more! Subscribing is free, you may unsubscribe without question at any time and your email address will not be passed on to any other party. Please click here to ensure that you keep up to date on the new Rules. 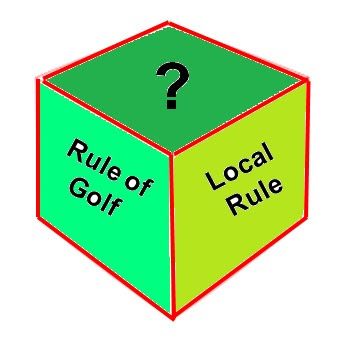 • The Rules do not permit a player to prefer their lie, but a Local Rule for 'Preferred Lies' does give the player this option. • The Rules only permit a player to take relief if a ball is embedded in its own pitch mark in any closely mown area, but a Local Rule can extend this relief to a ball that is embedded through the green. • The Rules state that a player may take relief from GUR, but a Local Rule often makes it mandatory to take relief to protect certain areas of the course. • The Rules do not provide free relief from trees, But a Local Rule often makes it mandatory to take relief from young trees, identified with stakes, to protect them from accidental damage. • The Rules allow any ball that is in bounds to be played, but if the course is divided, say by a public road that is defined as out of bounds, it would be unfair that a ball that lands on the road is out of bounds and a ball played over the road and back onto another part of the course is in bounds, so a Committee may introduce a Local Rule to deal with this circumstance. 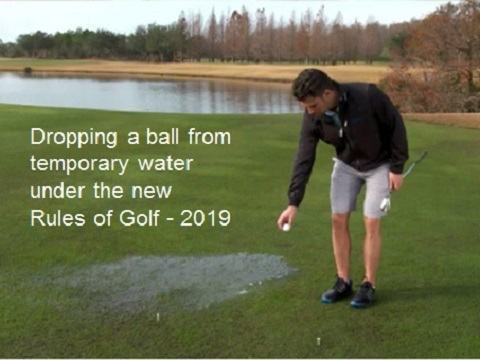 • A Committee may not adopt a Local Rule to assist players who cannot drive over a water hazard hazard by allowing them to drop a ball, under penalty of two strokes, in a dropping zone that is located on the green side of the water hazard. Decision 33-8/2. • A Committee may not make a Local Rule allowing a player to replay a stroke, without penalty, if their ball has been deflected by course furniture, e.g. direction signs or sprinkler heads. A deflection of a ball by such an outside agency is a rub of the green and the ball must be played as it lies. Decision 33-8/12. • A Committee make not make a Local Rule providing relief without penalty from divot holes. Decision 33-8/34. • A Committee may not make a condition of competition requiring that a competitor must enter their score into a computer. Decision 6-6b/8. Thank you to the 1,300+ readers who have already subscribed to The Oswald Academy newsletter on the Rules of Golf. Let me remind others that I am now working in association with Brian Oswald to bring you the latest content on the Rules, presented in a variety of formats to assist you in understanding the new Rules of Golf that become effective on 1st January next year. Click here to make sure that you do not miss out. The newsletters are free, you can unsubscribe at any time and your email address will not be shared (Brian is a lawyer who lectures on GDPR!). Want to Learn the New Rules Numbers? For those of us that need to familiarise ourselves with the new Rule and Section numbers (99 of them! ), a valued subscriber, Martin Fraga, has uploaded them to Quizlet, a useful application that provides a novel and even entertaining way of approaching this task, I especially recommend this free tool to all those that are studying for the R&A and USGA exams; check it out and save it to your smart devices for easy reference whenever you have a few minutes spare; Quizlet flash cards. Thank you Martin for responding so quickly to my request and once again providing this excellent resource for Rules of Golf enthusiasts. It is obvious that Golf Clubs, Societies, Committee Members, Rules Officials and all serious and recreational golfers, are going to require a lot of information and assistance to properly understand and apply the new Rules of Golf, which become effective everywhere in the world from the 1st January 2019. From different interactions I am having I realise that many golfers are underestimating both the scope and the consequences of the radical changes that will have to be observed, applied and governed in all formats of golf competitions. I recently made a decision to continue with my commitment to assist golfers of all abilities to learn and understand the new Rules of Golf with a mix of ‘no cost / low cost’ Rules resources. However, in view of the size of this task, I am pleased to say that I will be entering a partnership with Brian Nygaard Oswald, founder of The Oswald Academy - ‘A world of nothing but the Rules of Golf’. Check out Brian’s web site at www.golfrules.com for information on his past performance and evolving success in this area. Brian and I believe that we are ideally matched when combining our individual expertise and ambitions and that the opportunity to work together will benefit both of us and more importantly, benefit our subscribers and customers. Soon after the first meeting that Brian and I had to discuss how we could jointly advance our interests, I realised that it was imperative for me to follow up on my previous ‘999 Questions’ books with one that addressed the new Rules. I am still convinced that an excellent way for golfers to better their knowledge of the Rules is by learning how they are applied and testing themselves through questions and answers, with accurate references and explanatory notes to support the answers. 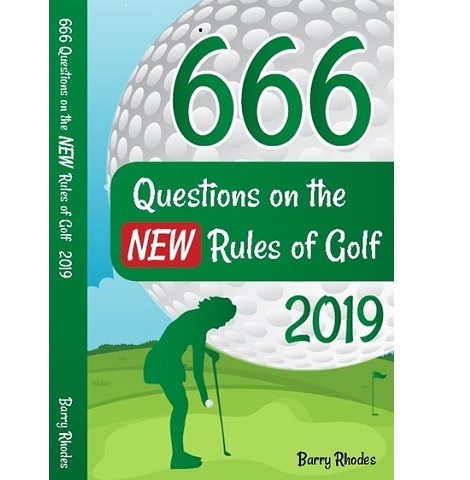 I have already made good progress with this and hope to publish ‘?99 Questions on the New Rules of Golf – 2019’, in the 3rd quarter of this year. The “?” is because I do not yet know how many Q&As there will be when I have finished; it will be more than 499 and less than 999! Brian and I also intend to merge our emails to subscribers on the Rules of Golf. Some of you have already received the last ‘Rhodes Rules School’ weekly email from me, having reached the end of the ‘Pros Getting it Wrong!’ series. However, you will start receiving new emails from us, mainly addressing subjects on the new Rules and incidents relating to them that happen on the Professional Tours. I have never subscribed anyone to my lists without their permission, nor have I passed on anyone’s email to a third party. As always, if you want to be removed from the new emails you will be able to unsubscribe at any time, by clicking on a link at the foot of every email, or by emailing me personally at rules@barryrhodes.com. I hope that I can encourage you to stay involved with our combined Rules resources, as there is much to learn and those who gain a good understanding of the changes will benefit from avoiding unnecessary penalties and being a source of information to club or society fellow members and casual golf companions. After sending the above email to my ‘Rhodes Rules School’ subscribers last week many of them have already signed up to receive the Oswald Academy emailed newsletters on the Rules of Golf (one or two each month). I strongly recommend that you too subscribe to this newsletter, which will replace mine over the next few months. Between us, Brian Oswald and I will be endeavouring to keep you updated on all things related to the Rules of Golf, including explanatory articles, incidents and rulings on the Pro Tours, quizzes, book recommendations, teaching materials and tips, seminar information and much more! 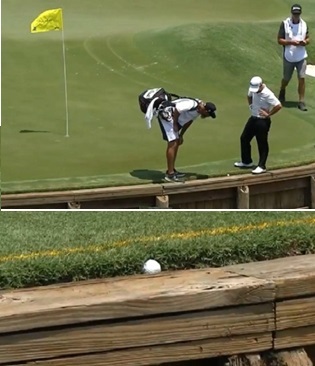 I think that those of you that, like me, are interested in Rules incidents that happen on the Pro Tours will be interested in what happened to Kelly Kraft’s ball after his drive on the 14th hole at Hilton Head Island, South Carolina, USA, on Friday 13th April. Normally, I write my own overview of these rulings, with references to the relevant Rule or Decision, but on this occasion, for brevity, I am providing this link to an account of the incident from the PGA Tour web site. I cannot let this opportunity go without reminding you that my new book, ‘Pros Getting it Wrong!’, recounts 99 similar, interesting Rules situations. It is available direct from me as an eBook (low price!) at this link, or from Amazon, as a more expensive paperback.